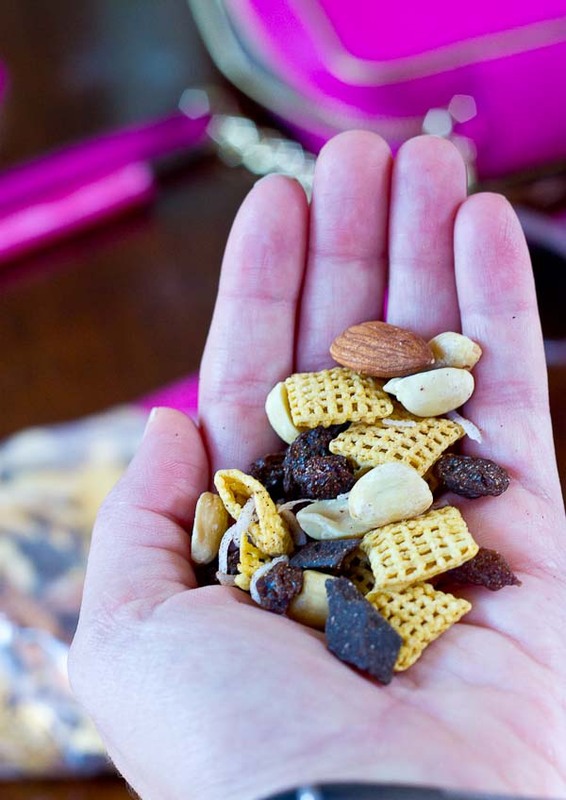 This yummy Sweet & Salty Trail Mix is easy to prepare and makes a quick and convenient snack. Packing healthy snacks is key to staying fueled while traveling and on the go. Hi friends, since Eric and I are in DC this week. I thought I’d share with you some of my favorite snacks to pack when I’m traveling. With my many of my clients, travel makes it more challenging to eat well and on a normal schedule. So I’m always encouraging them to pack healthy snacks. 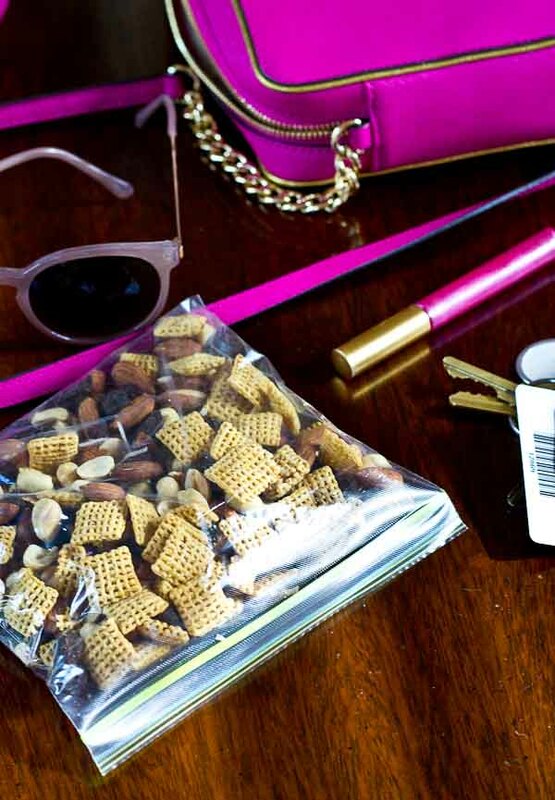 My favorite snacks to pack for travel. Fruit and nut bars— KIND and Larabars are my go to. Eric has fallen in love with “Lara” lately because they are whole food fruit and nut bars– meaning no added sugar (in MOST varieties)… unless they contain chocolate, which are my favorite ones! I love Chocolate Chip Cookie and he’s into Cashew Creme. DIY Trail Mix. Mix your favorite nuts, fruits and spices together and pack in snack bags– get the recipe for my sweet and salty mix below. Beef Jerky. I’m pretty obsessed with this new line (or maybe just new to me) of jerky called Simply Snackin’. It’s low sugar and high protein. Most of their bars are 60 calories, 11-13g protein, and less than 3g sugar. They have venison, beef, turkey and chicken varieties and a super clean ingredient list and best yet, the flavor is amazing. My favorite is Beef, Cherries and Berries. Love that sweet and salty. Right now you can only order these online. Canned Tuna. If you’re used to high protein eating, pack some canned tuna or pouches in your suitcase, just make sure they have an easy to open top that doesn’t require a can opener. Wild Planet is one of my favorites to travel with…. plus it’s lower mercury. Great for this pregnant lady. Peanut or Almond Butter Packets. Justin’s makes single serving natural peanut and almond putter packets.. perfect to smear on fruit or top on your breakfast oatmeal. Make sure to check the label and choose natural to avoid trans fats. If you can run by a grocery store when you get to your destination, stock the fridge with some of these. We ran to Whole Foods yesterday evening and I picked up a few items to stock our fridge. Corn Chips & Salsa <– This is Eric’s pick. He’s gotta have his salty crunchy fix. 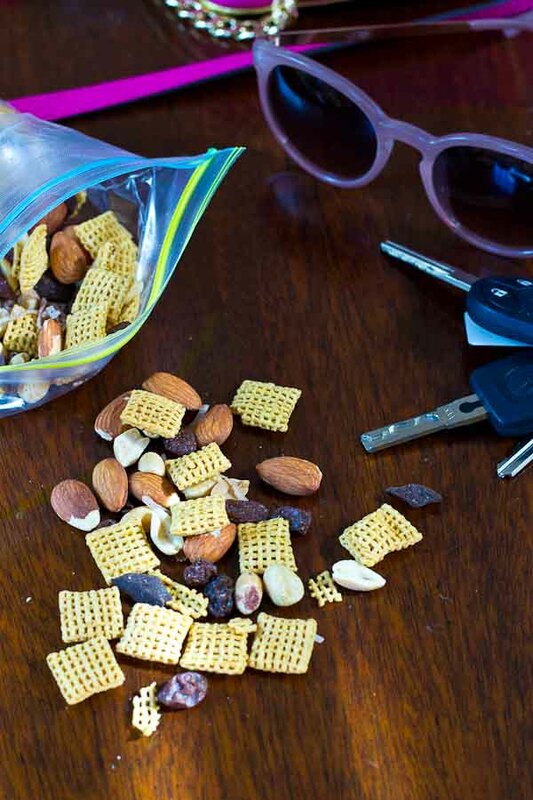 Now on to the sweet and salty trail mix recipe that you’ve all been waiting for. What are your favorite snacks to travel with? In large ziploc bag or bowl, combine all ingredients and toss together to distribute cinnamon throughout. 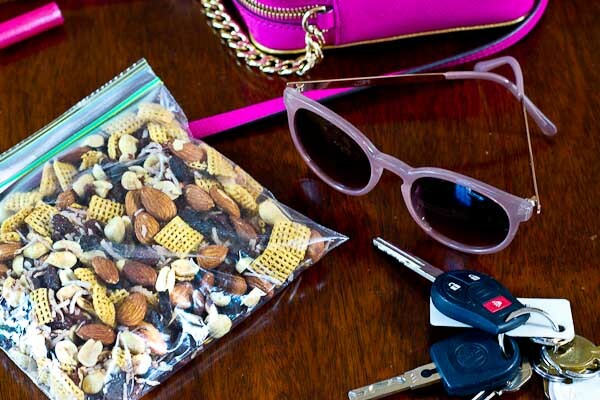 Pack into single serve snack packs for grab and go convenience while traveling. tea bags are a great idea! !